Bigger isn’t always better. Newquay, Cornwall is proof of it. While we’ve had an amazing time visiting some larger cities like London, Bangkok, and Madrid, sometimes less is more. A place like Newquay has so many of the offerings of larger places but in a smaller, quieter package. And so if it isn’t obvious by now, this is going to be about Newquay and its awesomeness, and our journey through it all. Newquay has its off season and its busy season, much like the rest of the travel industry. This is because Newquay is a seaside holiday destination, and one of the most popular ones this side of England. Our trip coming into Newquay was an admittedly uncomfortable one, as we chose the most affordable option: a low-cost, overnight 8-hour bus that would bring us over from London. Transportation and accommodation rolled into one. And although sleeping on that bus was as comfortable as stretching in freshly-shrunken pair of skinny jeans (the seats didn’t even lean back), I’d do it all over again just for the sake of convenience. When we finally got off the worst bed of all time at around 8 AM, what immediately stood out to Marta and I was how calm Newquay was. Throughout our time there, we noticed more and more that there was a calm, relaxed energy to the town and those living in it. It didn’t matter the time of day. And, never is this juxtaposition more obvious than when coming from frenetic London. Cornish pasties are all the rage in Cornwall (and in turn, Newquay). People and dogs line up everywhere for ‘em. Disclaimer: We’ve partnered with St. Christopher’s Inn to bring their fun and affordable hostels to our audience. 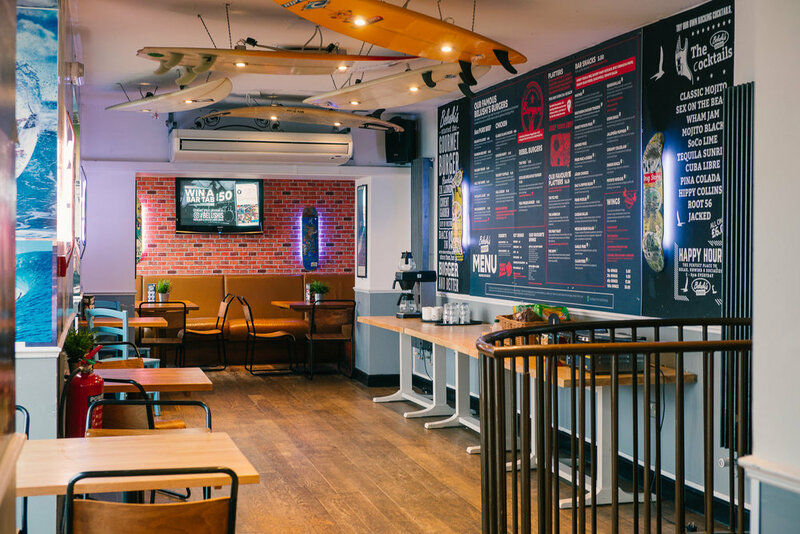 TL;DR of this section: we love their hostels, and in particular the one in Newquay! You might be staying in the city of your dreams, but if the place you're staying at is a nightmare of a hotel… You're gonna have a bad time. 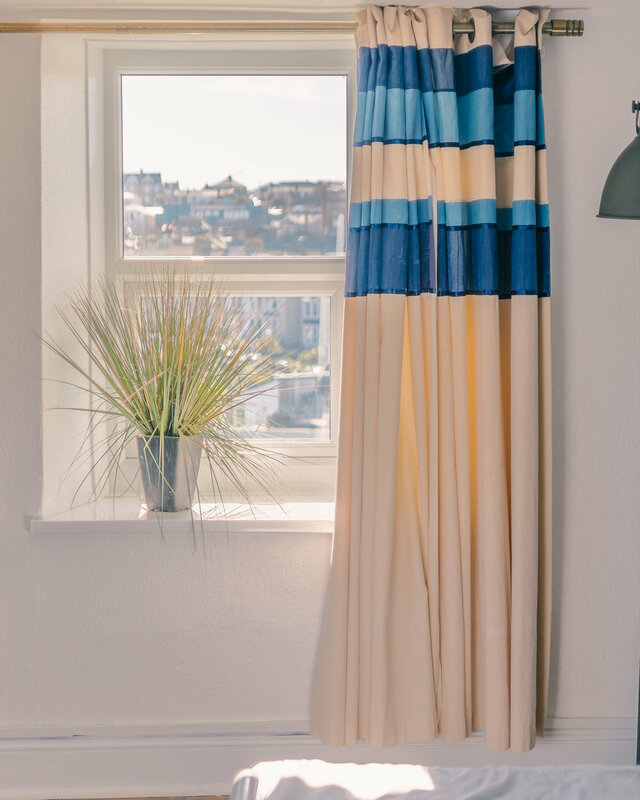 Luckily for us, the place we stayed only enhanced our experience in Newquay, so much that it was one of the main reasons we liked the city so much. St. Christopher's Inn in Newquay and their accompanying Belushi's bar was our home in Newquay, and we couldn’t have been happier. Picturesque beach views, friendly international receptionists/bartenders, and amazing two-story burgers. And as always, the hostel was located right near the center of town, which is great in Newquay because you can’t really get very far unless you’re driving... or comfortable walking for a few hours. If you want to book your own stay at this beautiful oceanside hostel, check them out here! As we were enjoying the hostel’s views, we noticed the next thing that Newquay is undeniably known for. Ok, “surf capital” might be a bit of a stretch. But, Cornwall in general is certainly one of the premier locations for surfing in all of England. For example, I took this photo of a surf school going out into the water amidst cold weather and endless rainy forecasts; it was the end of March but England had just given us the third January of the year. We also spoke with some of the locals and staff at St. Christopher’s Inn, and they told us that in the summer, the beaches are filled with camper vans and people nearby just waiting for the first chance to get out on the water to surf. Furthermore, the neighboring Fistral Beach is home to annual national and international surfing competitions. 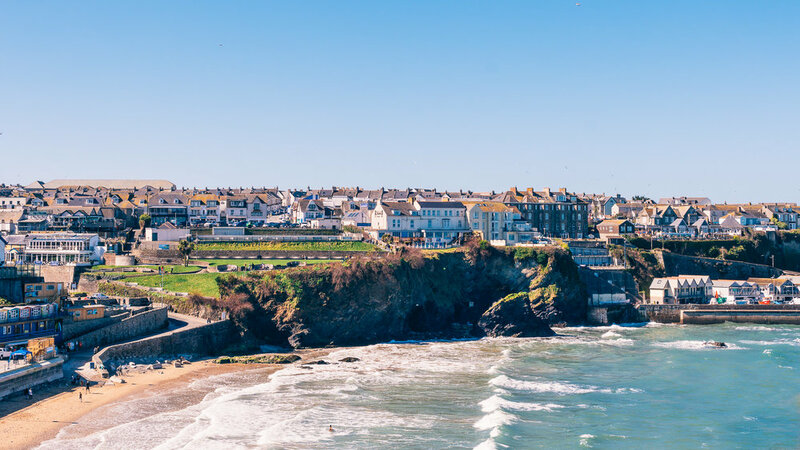 The point is, whether you want to pick up surfing basics at one of the local schools, or you’re traveling with your own board and leash – Newquay is the perfect place to stay. If you love dogs, you’ll love Newquay and the surrounding areas. Walk down any of the streets during the day and you’ll find yourself surrounded by adorable/majestic/tiny dogs – of all cities we’ve been to, this is the most dog-friendly yet. We noticed even more dogs in Padstow: it seemed like every other person was attached to a dog (or three). It’s not just the sidewalks where you’ll find cute dogs frolicking; if you make it out to several of the beaches hugging the shores of Newquay, you’ll find yourself surrounded by adorable dogs chasing balls and scouting the water (mostly for balls they’re still chasing). For a great walk through the town, a few of its beaches, many of its dogs, and the harbour, follow along here: http://www.allaboutcornwall.com/Cornwall_Places/Newquay/A_Walk_Around_Newquay_Cornwall.html. Newquay wasn’t the only place filled with a myriad of dogs, either. We made it over to Padstow and found the quaint town to be just as dog-friendly (if not more). But why were we in Padstow? We ventured out to Padstow, which is just a little to the north of Newquay, to go on a “sealife safari.” Although there are options in Newquay for this kind of sea adventure, the overwhelming positive responses that Padstow Sealife Safari has online had led us to choose them over the competition. They have different activities to choose from: a “sealife safari bout tour,” a “seals cave experience,” and a “coastal power boat tour,” along with a private, hired bout tour that includes your very own skipper/guide. Check out the different options here! For reference, I generally don’t even feel comfortable on the water, and especially not on smaller boats. On this hour-long expedition, however, we had an amazing time in the front seat. I actually enjoyed every bump and splash – not to mention all of the photos I was able to take. It was an amazing time. After our aquatic adventure, we had to find a place to eat. What can you find in Newquay (and Cornwall) that’s made of local ingredients and is out of this world? I can’t remember the last time I had eaten fudge, or even the last time I would have thought of it, and yet… after leaving Newquay, fudge is now at the very top of my list of what to eat in Cornwall. There are fudge shops everywhere in Newquay, so we decided to stop at the one that looked most alluring. Our choice was Roly’s Fudge, which we later came to find has a few branches elsewhere in England and the UK, and a new one that’ll be popping up in London’s Camden Town in spring of ‘18. This is freshly made and looks different from the finished product – we promise the variety of fudge flavors they have is delicious and looks amazing... We just ate it too quickly to properly photograph it. In any case, the aroma whisked us in and the sample fudge had us pointing at different flavors to take back with us no time. And… the fudge didn’t last very long. (Not long enough to photograph, anyways.) The price was very reasonable and well worth it, too! While we’re on the subject of food, I’d hate myself for not mentioning one of our favorite midday activities in Newquay (and London in general). 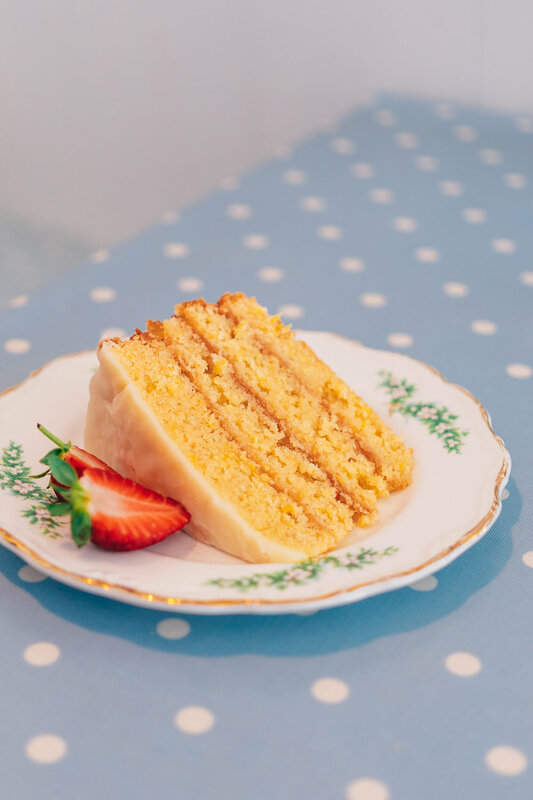 We mentioned it in our London article, but what we didn’t say in that article was that our absolute favorite scones of all came from a humble, unassuming cafe in Newquay: Cafe Cloud. We’ll take 75 of these to-go – thanks. You can get yourself a scone with clotted cream and jam just about anywhere in Newquay, similar to fudge. But the scones served in Cafe Cloud are particularly fresh and plump, with just the right amount of flakiness, and when you pair it with its partners in crime, it’s an experience. Newquay is the seaside town that you want to visit in the summer for its pervasive salt life and incredible surf opportunities, and in the winter for its relaxing vibe and gorgeous views. This was just a few minutes walk from our St. Christopher’s Inn... the views you can find in this town are phenomenal! What town(s) have you visited that immediately made you feel like revisiting? Let us know in the comments below! The sun setting over the beautiful town of Newquay.